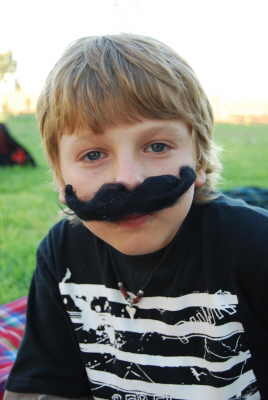 2008, the year that was. 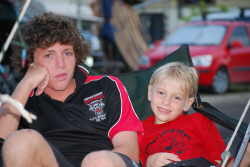 It seems like only yesterday that we set off from Bundaberg, camper trailer in tow for a real unknown adventure. Who could ever imagine that it was going to turn out to be anywhere near as great as it was. We have seen things, done things and experienced things that we could never have imagined. It has all been so effortless and has flowed so perfectly. It always amazes me how things just fall into place if we allow them to, as long as you have that 'go with the flow' kind of attitude. Our wish list of places to see in the future grows daily, with regrets currently sitting at a big fat nil. 2009 will see us continue and add to experiences and memories that will be a part of this family forever. 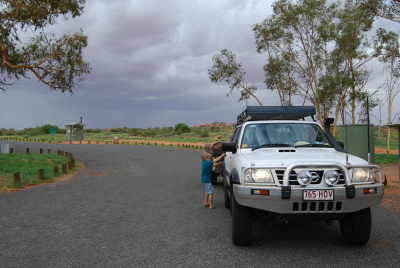 We left Yulara on Thursday 4th December after a number of going away dinners and a few Christmas parties. 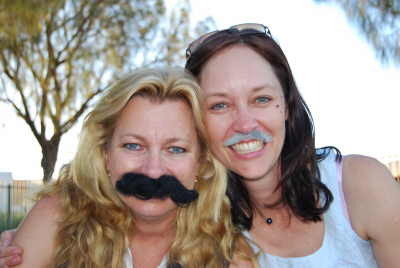 Just prior to leaving we attended a "Movember" afternoon at the Res club. It was all about raising money for 'Men's Health' (fancy that, someone worrying about men and their health) and was heaps of fun. The community spirit is very much alive and well at Yulara. If things work out we will be going back to Yulara after Christmas which will be good as we have made many good friends out there. In saying that though, by going back to the Rock does mean we will miss out seeing other things so there is mixed feelings on the subject. It is Alex and Harry who really want to return as they also have made some good friends and enjoy the freedom that this lifestyle offers. We will leave it up to the 'God of Travel' to see what the future holds. It will be just like every other place we have lived in during this trip, we will be sad to leave, but happy to move on as there is just so much still to explore. We did 3,570 kms back to Bundaberg in 4 days which was a bit of a feat. The kids were great and tolerated the 900km days better than expected. A combination of the new cruise control (sensational), the fact that the camper trailer is so easy to tow and because Chris shared the driving we were able to do the distances we did in comfort. Due to the late arrivals and very early departures we did spend two of the four nights in motels and one night at a friends house which only left us the one night in the camper at Barkley Homestead. Why on earth we stayed there again after our last experience is beyond me as it really is very average. I best not be harsh as it is in the middle of absolutely nowhere and is a lot lot better than nothing. My tip if staying there is to pay the extra and get a powered site, even if you don't want power. The sites are much nicer and you get a key to a much much better toilet block. The trip across was interesting even though we have been over these same roads a number of times before, because this time it was wet. In fact it was very wet and a number of times we actually had to pull up as the visibility was close to zero. To see this arid part of our country so wet was quite exciting. We arrived back in Bundaberg at lunchtime on Monday and spent the remainder of the day cleaning the inside of the van from top to bottom so we could sleep in it that night. Just sitting for the year unused really does create a mess, although I am not sure how. 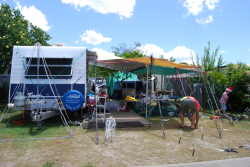 It was a very busy week unpacking the camper, packing the van, getting the car serviced, getting Alex's broken front tooth fixed and preparing for our 3 weeks at Cotton Tree on the Sunshine Coast. On top of that I also had 4 trips down to our house at Elliott Heads as the tenants were having problems with the pool. Just what I needed in the middle of a busy week. Oh well, better now than when we are on the road. We set off for the Sunshine Coast a day early on the Friday, mainly to see my stepfather Stuart (Pop to the boys) who has been in a nursing home all year and who is not doing well. He was in fine form giving cheek and reminiscing the times we have had together. While his mind is still sharp, unfortunately his body is anything but. Old age can be a cruel thing and something I am not looking forward to. Over the three weeks we had on the coast we went to see him every couple of days. Stuart is the only Pop the boys have had, and they have had many special times with him. I am not sure how they will deal with it when the inevitable happens. While we have tried to prepare them for it, only time will tell how they cope. The weather this year at Cotton Tree was sensational. Blue skies and more blue skies with only a few short showers and hot. In fact too hot some days. The poor air conditioner was never turned off. Last year was so horribly wet anything would have been an improvement. The usual gang were there, minus David and Wendy Nye as David was unable to get any time off work. While it wasn't the same without them, they did send one of their sons Andrew and his wife Erin instead. The boys loved them and they were so good to the boys. 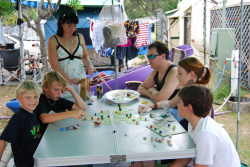 They played games with them and regularly took them to the beach. Kelvin and Ros from Bundy were opposite again and brilliant company. They are so much fun and it would not be the same if they were not there. Who would I go on all those shopping trips buying endless crap with?? Being so isolated for most of the year did leave us with a long shopping list of things to both research and buy, before heading back to the NT again. 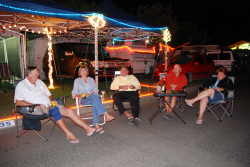 It seems that all the regulars in our area of the caravan park have had a good 2008 and they were all in fine form. Most nights we sat in the middle of the road having drinks and swapping stories from the year. Heaven forbid anybody who had the ordasity to attempt to drive down our street. If they tried we just sat there, with them giving up, backing out and going another way. It was a bit rude, but hey its Christmas. We again had our 'Secret Santa' night which was full of games and bad manners. Of course the highlight of the stay was the light display. Harry plans this for most of the year and oversees the entire event. Every year it gets bigger and brighter. This year Chris and Harry went shopping for a few new lights. 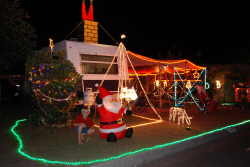 They returned with 8 new rope lights, a few sets of LEDs and a Reindeer with a moving head. I am not sending those two out again. The display in our street was outstanding, I think the best in the park. It really does add to the spirit of Christmas and brings so much joy to so many people, both young and old. 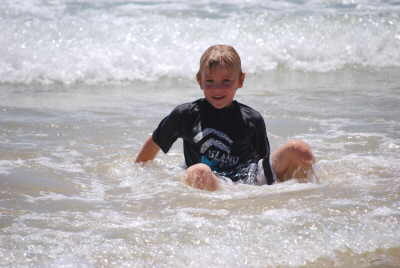 Alex was excited to see his surfboard again and took every opportunity to get out there and catch a few waves. With Kelvin, Ros and Daniel around he had some good teachers and has really come ahead. 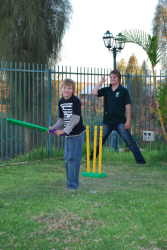 It is so nice to see the kids so enthusiastic about outside activities. I would go crazy if they were the type of kids to sit inside all day playing those brain destroying computer games. Christmas day was great. Alex woke at some ridiculous hour (0515) and wanted to wake us all. We made him read until Harry woke, but by 0730 I too had had enough so had to wake Harry so they could open their Santa presents. We then had pancakes for breaky and opened our presents. Alex scored a flash new skate board with no 7 bearings (yes, that is important apparently) and other flash gear while Harry got a new stunt bike. (I can see a broken arm coming on.) 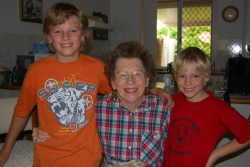 Chris's mother Jan was unable to get up as she recently had a major back operation, and although doing well it would have been a bit much, so she spent the day with relatives in Brisbane, also having a great day. We then went up to the Nambour Hospital to see Stuart (he had been admitted a few days earlier) and then to mum's for lunch. My brother Shane and his wife and boys came up and again mum overdid the lunch thing with enough food to feed a football team. We were back to the van by mid afternoon with the boys checking out their new toys, with me having the traditional Christmas day nap in the chair and left over prawns for dinner. How could you improve on that. Once again Desley and Trevor spoilt the boys, this year getting them each a little remote control car. The boys love them and have played with them everyday since. 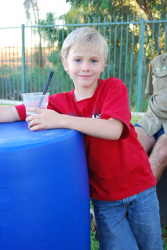 They are so good to the boys and great camping neighbors. I really have no idea what happened over the next week. It would seem a combination of friends visiting, going to the beach and generally relaxing saw the week disappear with great haste. Next thing it was New Years Eve. We sat around as a family and reminisced the year that was, the times we had had, and looking forward to 2009. It is hard to imagine that it could be better, but we will sure try and see that it is. In true Brett tradition I made it to 10-00pm before going off to bed. That would have to be about 30 years straight that I have failed in my pursuit to see it in. Chris stayed up as the family representative, doing whatever it is you do at midnight, with us all suffering the next day because she was tired and cranky. (Totally untrue and exaggerated as usual!! - Ed) At least I know my limitations!!! So that is pretty much it for December 2008. Short and sweet. We certainly hope you all had a great time over the festive break. We often get asked how or where should people send mail to us. Our Mailing address is the same: 31 Buss St, BUNDABERG 4670. The mail is then forwarded to mum who posts it onto us. We hope 2009 is a special year for you all, with our only advice being to 'Live your Dreams'. The web page will continue, and we will keep you informed of our adventures. 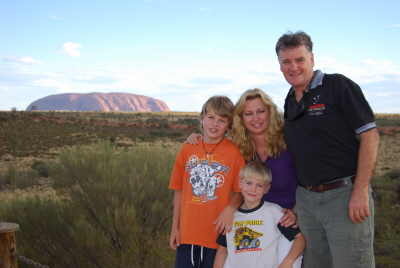 From all the Parfitts, we wish you a happy and healthy 2009. Take care. "Lead a life to be followed"